Datura is itself a genus and a group of poisonous plant species. Datura seeds, leaves and roots are used in traditional Indian and alternative medicines. All these species belong to potato family Solanaceae. Several datura plants and species are used as drugs and many other species are treated as weeds. Datura metal is used in ayurvedic medicine and religious purposes. It is widely used in asthma, persistence cough and pain disorders. Its effects are compared with codeine in persistent cough and all modern bronchodilators in asthma. All species have similar medicinal value and properties. However, the purple datura is most appropriate to use in medicines, according to ayurveda. Daturina-daturin alkaloids resemble with atropine. Due to following characteristics, datura is beneficial in a respiratory diseases and pain disorders. Only smaller dosages are used in medicines. Generally, datura seeds are used in Ayurveda, traditional Indian and alternative medicines. Before using datura in medicines, datura seeds require a series of detoxification and purification processes. These processes help to reduce the toxicity level in the human body and enhance medicinal value of datura. 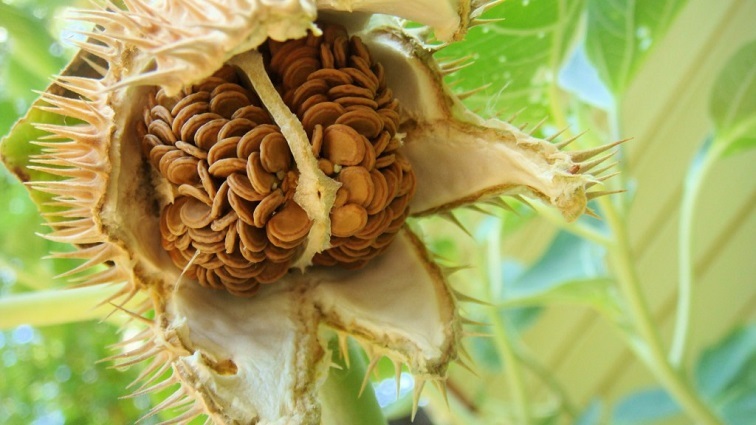 In raw form, datura seeds might be very dangerous and poisonous. Therefore, do not try anything described in this article yourself, just consult related professional for more detail. The plant as a whole has anodyne, analgesic, sleep inducing and antispasmodic action. Datura leaves have bitter taste and similar characteristic odor like datura seeds. It is used in preparing herbal plasters. It is also used as anodyne and antispasmodic. Datura leaves are most poisonous part of datura plant. Leave contain high amount of poisonous alkaloids known as Daturine and albumen in addition to mucilage and ash. These alkaloids contain about 25% potassium nitrate. All parts have almost similar medicinal characteristics and same action in the body, but seeds are mostly commonly used in alternative and traditional medicines. In alternative medicines like ayurveda and Unani, datura seeds are purified before use in various medicines. Datura containing medicines are used in respiratory diseases especially in productive cough and asthma. Due to various medicinal properties, datura is also used in other diseases related to pain, acidity, heart failure, decreased heartbeat, gall bladder stone pain, and abdominal pain after meal, Dysmenorrhea, pain due to kidney stone and enuresis. Datura is always used in low dosages under medical supervision. High dosage can cause severe side effects listed under this article. According to ayurvedic scholar Bhavamisra, if a patient suffers from indigestion, which occurs due to heavy meals and fatty foods, then datura seeds in dosage of 125 mg can help. Datura is also an herbal treatment of dog bite. Its roots are used in the treatment of symptoms of dog bite. The following mixture is used for this purpose. This mixture is given with cold water twice a day. This formulation is from the Sushruta samhita. According to Vagbhata, datura leaves juice is applied on scalp in cases of alopecia areata. According to Harita samhita, datura root is crushed in water and strained the liquid. This datura water is used in instilling in eyes with viral conjunctivitis. Bhavamisra has described the datura formulation for intestinal worms. 5 t0 6 drops of datura leaf juice is given to patients with buttermilk for getting rid of intestinal worms. A paste is made from datura leaves and mixed with a small amount of turmeric. This paste is applied on the affect breast for relieving breast pain. Bhavamisra has described this remedy in his book bhavachikitsa. Make a paste of datura seeds and apply this paste on cracked feet. This application helps in treating cracked feet. Bhavamisra has also described this remedy in his book bhavachikitsa. Ayurvedic treatment of schizophrenia also includes the use of white datura root. Charkradatta has described the following preparation in chapter Unmanda. Take milk and add white datura root powder, jaggery and ghee. Boil the milk with all these ingredients and strain the milk in a glass. Give this mixture to patient suffering with schizophrenia. Oil is prepared with various ingredients and datura leaf juice for ear infections. It works as antiseptic as well as antibiotic in ear infections. Take mustard oil and add all other three ingredients. Simmer the mixture until oil remains. Then strain the oil and discard residues. This oil is instilled in ear with infections and pus. Ayurvedic scholar Charkradatta has given this formulation. Datura seeds and pipper longum is used to treat filariasis. Datura root paste is prepared with water and applied on the carbuncles. It helps to treat carbuncles and prevents scaring. A juice prepared from datura, calotropis and castor leaves is applied on swelling and inflammation of joints due to rheumatoid arthritis. Hot paste of datura leaves is applied along the course of sciatica nerve to get rid of pain. Datura seed oil is used for the treatment of asthma. Kanakasavam is prepared from datura, which is generally prescribed for asthma and productive cough in ayurvedic science. The following formulation of datura is beneficial in cough. Gum arabic (acacia gum) Q.S. Tablets prepared in above ratio helps in relieving cough. This formulation is also used with honey without acacia gum. It is beneficial in productive cough. There are many formulation of datura used in ayurveda for epilepsy. All three ingredients are mixed in equal ratio. This mixture is instilled in nose during epilepsy attack. This mixture is given with butter in epilepsy. This mixture is also beneficial in diabetes mellitus. In Diabetes mellitus, this mixture is given with Saunf ark. The tablets, prepared using following ingredients in given quantity, are used to treat nightfall in men. Mix first three ingredients in powdered form and take this mixture with triphala water. Fresh Datura leaves are beneficial in malaria fever. A small amount of leaf paste is given with jaggery to lower the temperature in malaria. Abdominal pain may have many underlying causes. Some of these causes include gall bladder stone and kidney stone. In these conditions, datura and medicines containing datura are used to alleviate the pain. The following formulation helps in early discharge in men. This mixture is given with milk twice a day. Datura flowers are effective treatment of infertility in women. The dried powder of datura flowers in dosage of 120 mg is given with honey 10 days after menstruation. It is given for 5 to 7 days. This remedy is effective in infertility of unknown reason. Datura seed ash is given in dosage of one gram for seven days in patients complaining excessive sweating in hands and feet. Datura seed ash is the residue left after burning the datura seeds. Dry mouth is a common side effect. Allergic reaction on skin characterized by red spots, Urticaria type symptoms, itching and burning sensation. Datura can increase heart rate. It can increase intraocular pressure. It is most common side effects of datura and one of most dangerous effect on the body. Datura can cause hallucination and intoxication. The worse side effects include unconsciousness, coma and even death. The overdose of datura can result in anticholinergic poisoning due to its tropane alkaloids. It can cause cardiopulmonary arrest and sudden death. You should not consume any part of datura plant if you have any of following condition. Datura can have a worse effect in pregnancy. It can stimulate uterine contractions and may cause miscarriage. Obtain IV access if patient is not extremely agitated. Monitor all vital signs frequently. Consider thiamine and naloxone administration. Prefer to do not use ipecac or emetic medicines. Also, defer the use of activated charcoal, but it may require in cases of prolonged transport time anticipation. Check for hypoglycemia and altered mental status. Consider the use of benzodiazepines if seizures are present. The use of Physostigmine may require, but it is not recommended to use physostigmine in pre-hospital settings. Datura is one of poisonous plants. The higher dosage may cause severe adverse reactions. Ayurvedic doctors use it in minimal quantity. Please note this is an informational website and we serve information of traditional and folk uses, which does not mean our recommendations. Before using any part of herbs, you should consult with your physician. Cannabis oil also works wonderfully for diabetes, I am off all insulin due to it’s use. I had read Datura seeds and black pepper formula in social media site and then I started taking this in Jan 2015. I was also taking other medications advised by the doctor. My blood sugar level becomes normal from 220 mg/dL. After around 40 days, from mid February 2015, when I take medications advised by the doctor, it decreases my sugar level from the normal range and once I had hypoglycemia on 16 Feb.
Now, my doctor suggested stopping medications and regularly checking blood sugar level. I am checking blood sugar level daily after hypoglycemia attack. It is always normal and varies from 80 to 100 mg/Dl without medications. I also stopped taking datura seeds powder and I am just now eating black pepper powder. My blood sugar level is under good control alone with black pepper. I consider black pepper safe spice and we can use it on long-term basis. I stopped taking datura seeds because I am not sure about its safety for a longer period.